Last week I visited with a room full of female engineers, scientists and other professionals at Halliburton. 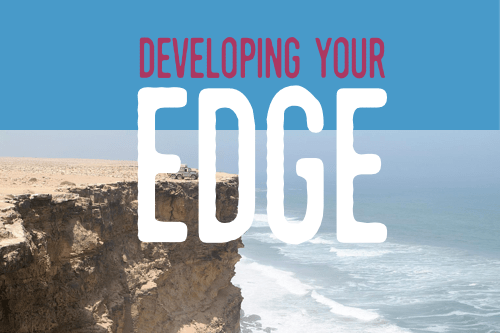 I’ve been speaking a lot with women’s groups across the globe about developing edge. Over the course of my career and life, I’ve come to appreciate what edge is and isn’t. Edge is the ability to step outside of the status quo and challenge it. Do you have an idea? Speak up. Make it known. It’s about seeing something different and appreciating diversity of thought. Do you see something others don’t? Help them. What it boils down to is having confidence. Edge isn’t defending the current establishment. Your job is not to become a part of the paint. It’s to change the color, tone and breathe new art into the world. Edge isn’t about one-upsmanship. (Yeah, I just made up that word.) In other words, you don’t have edge if you stomp all over people. In the real world, we call that being mean. During the Q&A session I always get asked what motivated me to become an entrepreneur or how I did it. I explain that leaving the comfortable corporate life is not as glamorous as so many make it out to be. It takes hard work, sacrifice, significant financial investment, long hours, and it can be stressful. Truthfully it isn’t for everyone. Equally, though, I also enjoy explaining how picking the right spouse (thanks Mark) and getting out of debt (can I get an A-MEN!) have been helpful in this journey. Once the conversation warms up, the questions always go to that place where women are curious about what I call the “dark side”. “Why do women hate on other women? Why don’t they help each other out? What can I do to help this,” they ask. I have a simple answer for this: at some point women become insecure. They lose their edge or never had the chance to develop it. Some never break free. As young women, we all have edge. We are carefree, whimsical, creative, and daring. There’s a time, though, in a young girl’s life where she loses her edge. Her confidence erodes and her faith in herself diminishes. There was a time in my life when I lost my edge. I spent time rubbernecking instead of living my own life. Getting sick and living through it to tell the story and have a beautiful family and wonderful career is what got me over that really quick. Why look at what you don’t have instead of just going out and doing the hard work and making it happen. The day I began to focus on developing my edge, I truly began living. You’re not born with edge. It’s like leadership, it can be learned. It’s a muscle that needs nurturing and growth. I attribute my confidence and character to both my parents. My father and I have always had a solid relationship. I’m grateful for this. He and my mother worked professional jobs in the 1980s when there were few dual professional career earners. But my parents had edge. They were always doing things that others weren’t. They sought out experiences for my sisters and I that gave us a diverse appreciation for life and work. They taught me to go outside the lines and be the best I could be. They taught me to develop my edge, own it and never apologize for it. Got edge? Lost your edge? Re-discover it? What did you learn?